Welcome to Canada! You will be met at Calgary International Airport and transferred to Banff in the majestic Rocky Mountains. Banff is a picturesque town located within Banff National Park. With Mount Rundle and Mount Cascade dominating the skyline, it is the quintessential Rocky Mountains town. This evening meet your Tour Director and fellow travellers for a welcome dinner. Make our way out of Banff and prepare yourself for one of the highlights of your journey, Canada’s “Diamond in the Wilderness”, the gorgeous Lake Louise. Spend time relaxing and exploring the surrounds of this iconic and beautiful area. Take a walk around the edge of the lake and gaze at the towering mountains reflected in the lakes surface, or venture inside the phenomenal Fairmont Chateau Lake Louise Hotel. Return to Banff and enjoy a sightseeing tour including the Bow River, the Hoodoos and Bow Falls. This morning we travel north along the Icefields Parkway, acclaimed as one of the most spectacular journeys in the world. Enjoy breathtaking mountain scenery as you pass rugged peaks and glaciers fringed by thick forest and shimmering lakes. We make a stop at the Columbia Icefield, North America’s largest sub-polar ice pack, where you’ll climb aboard the ‘Ice Explorer’ for a once-in-a-lifetime journey onto the mighty 300 metre thick Athabasca Glacier. The day’s end finds us in Jasper National Park, an alpine wonderland of pristine wilderness with an abundance of wildlife that can often be spotted roaming around the town. 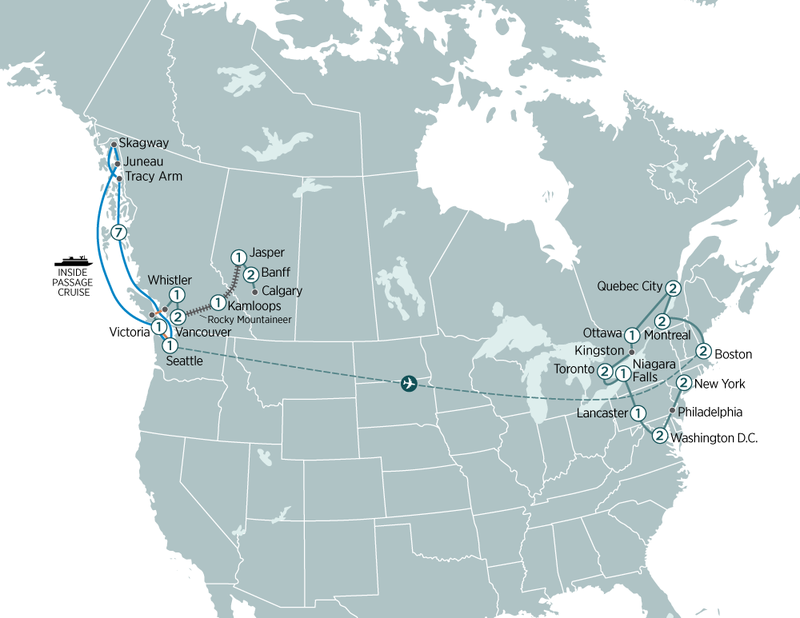 Today you have the opportunity to upgrade your journey to a two day rail experience on board the Rocky Mountaineer. Set off on “The Most Spectacular Train Journey in the World”. Settle back in your SilverLeaf carriage (upgrade to GoldLeaf at additional expense) and enjoy stunning views of the soaring mountains as you journey towards Kamloops. Rocky Mountianeer Upgrade is unescorted by an Evergreen Tours Tour Director. On this section you will be looked after by Rocky Mountaineer staff. Continue our journey on board the Rocky Mountaineer following the Thompson River and passing through the magnificent Fraser Valley. Late afternoon we arrive into Vancouver. Vancouver is a beautiful harbour side city with a perfect balance of nature mixed with cityscape. Enjoy a sightseeing tour including Stanley Park with its intricately carved totem poles, the waterfront area and Gastown with its lively shops and restaurants. Visit the Capilano Suspension Bridge Park where you can make your way across this spectacular suspension bridge, 70 metres above the Capilano River, and join the award winning Treetops Adventure along a series of elevated walkways. Journey inland along the Sea to Sky Highway as the road follows the rugged coastline with magnificent views of Horseshoe Bay on your left and forested parks and mountains on your right. You will have the chance to stop at the awesome Shannon Falls before arriving at the charming alpine resort of Whistler Village. Whistler is a world famous ski resort sitting at the base of magnificent Whistler and Blackcomb mountains. This afternoon you are free to explore the village’s cobbled pathways and plazas. Perhaps take the Peak to Peak gondola that travels between the two huge mountains affording magnificent views. Travel back along the Sea to Sky Highway to Tsawwassen. Board the BC ferry and cruise through the Georgia Strait that is dotted with forested islands and is home to pods of orcas. Arrive in Swartz Bay on Vancouver Island and make our way to the world-famous Butchart Gardens, a 22 hectare showpiece of magnificent, colourful gardens. Learn about the history and flora while exploring the gardens. You’re Invited: Tonight’s dinner will be in the original Butchart family residence, savour an exquisite meal while enjoying spectacular views of the surrounding gardens. Afterwards, arrive into Victoria, British Columbia’s historic capital city situated on a beautiful harbour. Today is free for you to explore Victoria. A picturesque harbourside city, it is perfect for exploring on foot. Transfer to the BC Ferry and cross the Georgia Strait to Vancouver. Board your luxurious cruise ship and check into your comfortable inside stateroom (upgrade to ocean view or verandah staterooms additional expense) on the Holland America Cruise Ship ms Nieuw Amsterdam. Settle in for an unforgettable 7 night voyage through the famed Inside Passage. One of the greatest cruising routes in the world, the Inside Passage stretches through stunning landscapes and offers opportunities to spot some of Alaska’s most iconic wildlife. The great Klondike gold rush lives on in Skagway’s charming city centre of restored 19th-century buildings and its historic railway. Established in 1897 as a trading post for prospectors, it was once an untamed town that was the starting point for the gruelling walk up the Klondike Trail in search of gold. Early this morning your cruise ship enters the iceberg-strewn waters of Glacier Bay National Park, where thirteen spectacular glaciers ?ow from surrounding mountains into the waters of the bay. A National Park Service Ranger will help you spot wildlife, while pointing out sights and explaining glacial activity. Perhaps you will be lucky enough to see a pinnacle of ice ‘calve’ or break away from the face of the glacier, and with a thunderous boom land in the bay. Today is a day of relaxation. Take advantage of the ship’s many outstanding facilities, or simply relax on deck and watch unmatched scenery glide by as you travel south through the Inside Passage. Day 28 - Lancaster – Washington D.C. Spend 2 days on board the spectacular Rocky Mountaineer, stay at the iconic Fairmont Chateau Lake Louise & discover Alaska on an unforgettable cruise.